Would you like to getter better results in your life for the same amount of effort? A special map called Local Space can help you align your actions with the natural flow of your personal energy. Whether you are hopping into your car to go to the neighborhood health club or flying to a conference in a distant state, your personal Local Space map can improve your opportunity for success. Many people are familiar with the well-known Astro*Carto*Graphy® Maps (A*C*G), which is printed on a flat map of the world or a specific region. The lines on an A*C*G map indicate locations in the world that hold various aspects of your personal power. For example, a Venus A*C*G zone is generally good for relationships, artistic endeavors, and/or real estate activities. That highlighted energy is valid in the specified location whether you travel/live there or not. 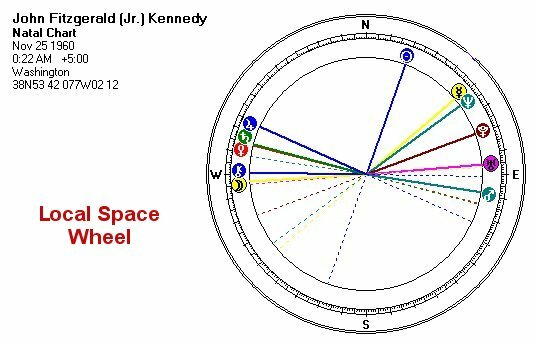 A Local Space map, on the other hand, is a round wheel that looks like the spokes of a bicycle wheel emanating from a central core—-see the example above, which is for the birth chart of the late John F. Kennedy Jr. (According to his AstroDataBank Record, John F. Kennedy Jr. was born on November, 25, 1960, at 12:22 AM EST in Washington, DC, , rated A from news clippings and the Clifford Data Collection.) My preferred method of creating this map is to relocate your birth chart to your current city of residence, then to print the map onto a transparency. This allows you to place the Local Space wheel over a map of your city, a home floor plan, or even the map of your upcoming trip to Europe. The lines on a Local Space map indicate directions of travel. Your chosen direction helps you align your intent with the natural energy of your birth chart. Each planet is responsible for specific activities, termed rulerships. When you combine an activity with movement along a Local Space line for the planet that rules that activity, you add power to your intent. 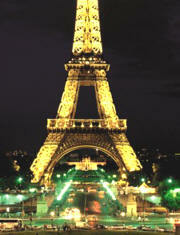 For example, among other things, Venus rules love and romance. If you cannot live on your Venus A*C*G line, you can use a Local Space map to enhance Venus energy by moving from Point A (your home, for example) to Point B (a restaurant for romantic purposes) along a Venus Local Space line. If you want to maximize your exercise program, you could walk, jog, or join a health club on an athletic Mars line. You could also place an exercise bicycle on your Mars line in your home. If you exercise on a changeable Moon line, you might jog strenuously one day and stop to smell all the flowers the next day. In the above example, Mars rules exercise and the Moon rules emotional comfort. Although space does not permit us to go into it here, know that you can use a Local Space map to rearrange furniture in a personalized Feng Shui If you want to write your book, you could put your computer on a Mercury or Jupiter line. Although Local Space Maps were originally designed for use in your home or community, they also work quite well on a larger geographical level. Simply look at the closest Local Space lines to the direction of travel. The map of JFK Jr., shown below, provides a good example. A Local Space line emanating from his Washington, DC birth place to Dallas shows that his closest Local Space Lines there were Pluto (death, transformation), a moon’s node line (destiny), and a Uranus line (unexpected events). His father, President Kennedy, died unexpectedly in an assassination on this line on JFK Jr.’s local space map. 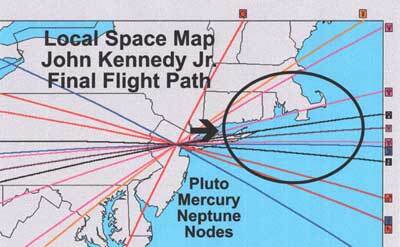 Relocating the Local Space map from young Kennedy’s birth place in Washington, DC to his fated airplane departure point in northern New Jersey shows that Pluto was also emphasized there. The same Local Space Pluto line as his youthful trip to Dallas also extends along his final flight path to Cape Cod. It should be noted that a person does not necessarily die when they travel on a Pluto line, but some aspect of their life is always transformed. Although this will raise the eyebrows of technical astrologers, my work with thousands of clients over the years suggests that wide orbs work well in Local Space astrology. Within range of Cape Cod are Mercury and Neptune Local Space lines, which exemplify the confusion in the media over his whereabouts after the plane crash. You can use Local Space to travel the world. If you are in London and need to decide if the next stop is Paris or Rome, the Local Space lines going from London to Paris, or London to Rome, will help you understand the purpose of your trip. If you want to go to art museums, you could travel on a Venus line (rules art). Knowledge of your personal Local Space Lines helps you to travel along lines that fully support your intent. You can amplify the results you desire by adjusting with your path of travel. Although you must still put forth the effort to accomplish your goals, it is nice to know that you can amplify your opportunity for success using the tools of relocation astrology. Note: Mark Dodich contributed another item to this collection of articles, a free 11-page download of the astrological signs of U.S. cities and states. See it here. Bio: Mark Dodich has been an astrologer and intuitive consultant since 1980. He is a Certified Astrological Professional with an international practice based in Portland, Oregon. He works in numerous facets of astrology, with specialties in Relocation Astrology and Seven Ray Spiritual Purpose Esoteric Astrology. Call him at 503-252-1558 for a free copy of his Astromark newsletter, or check out his web site at www.astromark.us. On his webisite, he also offers a free 22-page Astrology Primer with the basics of planets, signs, and houses. Email mark@astromark.us with PRIMER in the subject line, or simply click on this email form. Mark will reply with a Word .doc. CREDITS: Web design by Donna Cunningham. The background tile came from ABC Giant. The Victorian house is a design of Cool Archive.